Sneaks and Snitches is a very clever game – it’s incredibly simple but delivers a lot of interaction in the form of trying to out think your opponents. During the game, players are all thieves trying to steal gems and items so they can win by scoring the most victory points (VPs). Each round a number of loot cards (depending upon the number of players) are placed in the centre of the table and each one has a letter next to it. Most loot cards show a number of coloured gems the player that steals it will receive, but they also show items worth VPs and a few other items. Mr Jack is a clever 2-player game that mixes deduction with movement – I put it that way as purely saying it’s a deduction game can give the false impression that it is dry or shallow. 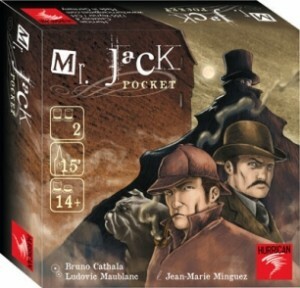 The original Mr Jack and it’s follow-up, Mr Jack in New York, are both games where one player is Mr Jack (the Ripper) and the other is the investigator. Players take turns moving the various suspects as the investigator tries to deduce which suspect is Mr Jack before Mr Jack escapes off the board. The deduction in those games is made by saying whether Mr Jack is standing in the light or not at the end of each round. Recent real-life stuff have meant I haven’t been able to post as many reviews as usual but I just wanted to say that I shall be adding more new reviews as usual over the next weeks. 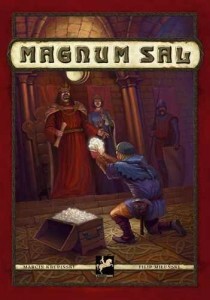 I posted a review of Magnum Sal today and more will follow including some new reviews of iPhone boardgame conversions too. I had a chance to play Egizia again this week which I still think is a great game. So many tricky decisions, clever game mechanics and lots of interaction – definitely one of my favourite worker placement games. Japan seems to be shaping up to be the big gaming theme this year. Amongst the games, I saw an announcement this week that a game called Shitenno is coming which is by the same designer that created the excellent Yggdrasil and Offrandes. So, I’m definitely keeping an eye on that one. Plus, Ninja from AEG looks cool too with hidden movement. Remember that bdg.ms is a good source of links to many of the latest board gaming posts (plus anyone can use it to shorten and share boardgaming links too). Magnum Sal was a game that caught my attention just before last year’s Spiel in Essen as I like worker placement games; however, I never got to play it and, until recently, kept missing opportunities to do so at one of my regular groups. Magnum Sal is a game about Polish salt mining – yes, you can’t beat it for having a theme that makes it different to other games. Each player starts with a few miners which they can use to either go into the mine or they can be an assistant at a town building. 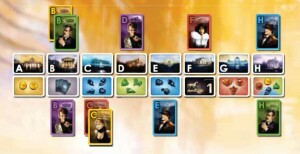 Each turn, players take turns taking 2 actions each (place workers, use building, extract salt). The goal is to make as much money as possible (primarily by mining salt). There are two distinct areas of the game: the town and the mine.